Around 30 athletes carved out a little time in their race week to give back. Some Ironman competitors in town for a race in the Woodlands this weekend flexed their charitable muscles on Thursday. Several race participants helped Harvey-impacted homeowners make repairs. Ms. Dorothy’s home of 50 years got a new coat of paint on Thursday. “They’re doing excellent work and they’re having fun doing it,” said Ms. Dorothy. Ironman competitors traded their running, swimming, and bicycling gear for things like paint brushes. 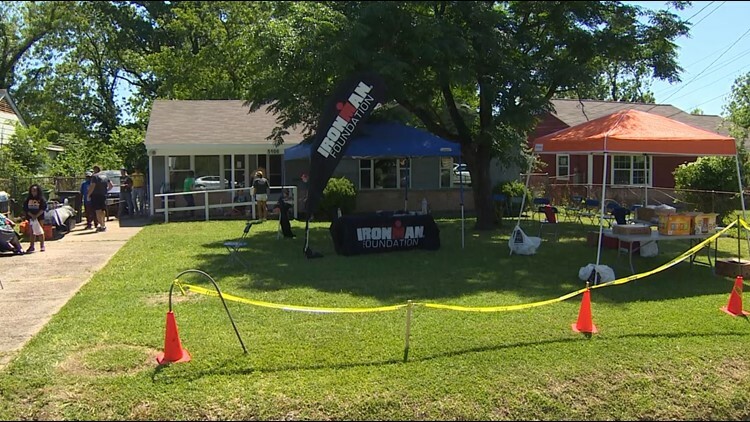 The Ironman Foundation partnered with Rebuilding Together Houston. That organization previously helped people like Ms. Dorothy muck out their flood-damaged homes. There’s still a lot of work to do eight months after Harvey dumped record amounts of rain in the neighborhood - where resources have not as been as readily available as in other areas. “Ms. Dorothy has lived here for 50 years and made all of her memories here with her family,” said Julie Mintzer with Rebuilding Together Houston. Thankfully, things are slowly getting better with the help of well-trained volunteers. “Oh they are great people, my God,” said Ms. Dorothy. Rebuilding Together Houston is always in search of volunteers for projects around the area.